Control Panel: Provides controls to process interactions in your contact center and to manage agent status. For a quick look at the Control Panel functionality, refer to the Agent Console Quick Start Guide. 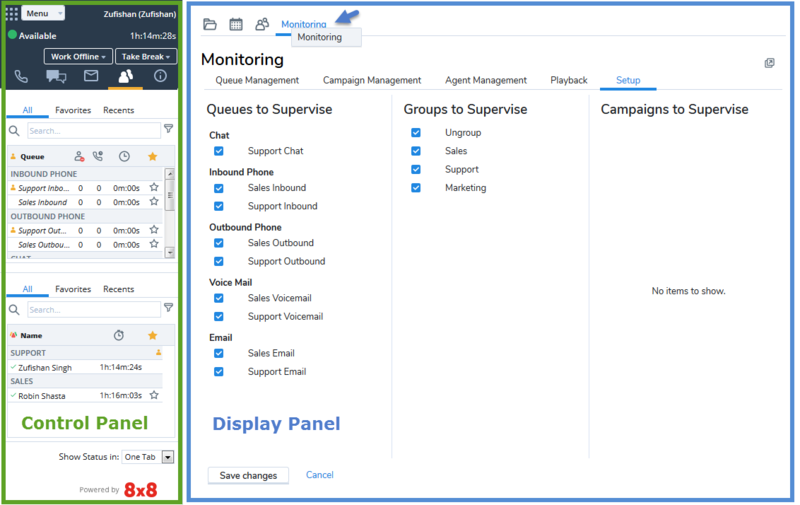 Display Panel: Provides access to CRM data, profile settings, agent directory (only available to Unified Login with Virtual Office users), and message recording settings. Use the Agent Console Control Panel to access the controls and status information, process an interaction, and work with Agent Console tools. Inside the Control Panel, use the Status tabs to maintain your agent status. Agent Console dynamically adjusts the Control Panel tabs in response to the interaction type and task you are performing. For example, phone interactions are processed using the Phone tab. 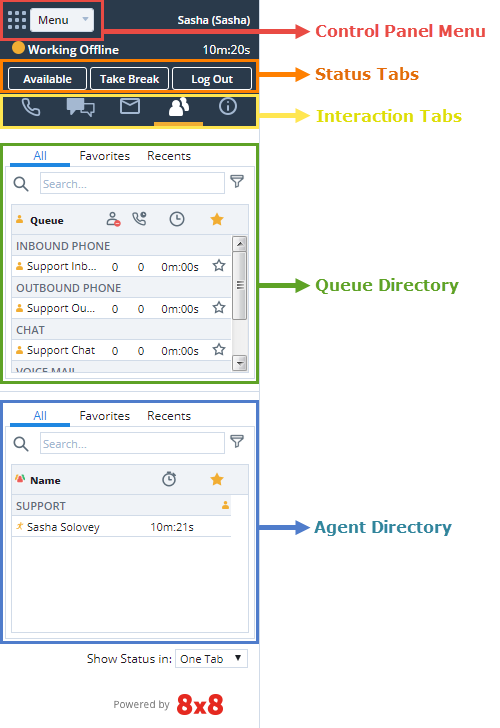 Phone tab: allows agents to manage phone interactions. All call handling functions such as making calls, placing a caller on hold, conferencing and transferring calls are performed using the Phone tab. Chat tab: allows agents to manage chat interactions from customers or from other agents. Email tab: allows agents to accept and respond to emails. Status tab: displays agents, and queue information such as the number of calls waiting, calls in progress, and the status of logged in agents in your group. Notices tab: allows agents and supervisors to post and receive informational notices. Profile: allows agents to view or edit their Agent Console account settings. My Recording: allows agents to record messages to be played to customers. Monitoring: allows agents to display the SupervisorAn agent with the supplementary privileges required to create FAQ categories and answers, monitor agent interactions in progress, listen to recordings of previous interactions, and create reports for the agents groups they supervise. Console QueueA queue is an ordered collection of interactions waiting to be served by agents qualified to respond to these interactions. In addition to enabling the call center administrator to customize how incoming interactions are prioritized and routed, queues also ensure that interactions are never lost or discarded. and agent management tool in separate browser window. Report: allows agents to display the Supervisor Console report selection and generation tool. External CRM: allows agents to initiate an integrated External CRM session. CRM: allows agents to access cases, customers, and tasks from the Local CRM. CollaborateSee Desktop Sharing. : allows agents to remotely connect to a customer computer with remote desktop control options and Co-browsing capabilities. This feature is available if your account includes the optional Collaborate feature. Co-browsing: If subscribed to Co-browsing feature, agents can assist customers via a co-browsing session. Agents must enter the session ID communicated to them by the customer in order to establish the session. See Co-Browsing for more details. Help: allows agents to provide access to FAQ questions, links to our user guides, and 8x8, Inc. Support. You can send your feedback directly; attach images or debug logs from the Help menu. FAQ: allows agents to access frequently asked questions and answers for repetitive use. User Guide: allows agents to access the product documentation and tutorial videos, and learn about the latest features in a separate window. Support: allows agents to access our knowledge base, articles, videos, support telephone numbers, and live chat. Send Feedback: allows agents to send product feedback and suggestions directly to our developers, and attach images or debug logs from the Help menu. See Send Feedback. Note: The Collapse Window button at the bottom of the Control Panel hides or shows the Display Panel. Chrome and Firefox do not support the Collapse Window functionality in Agent Console. 2. Display Panel The Display Panel provides access to CRM data, profile settings, and message recording settings. The Display Panel opens with three default tabs and opens additional tabs for each menu action. Customers: lists your open case records by customer. Cases: lists your open case records. Tasks: lists the tasks assigned to you. Monitoring: allows supervisors to review and actively monitor agents, queues, groups, and campaigns.